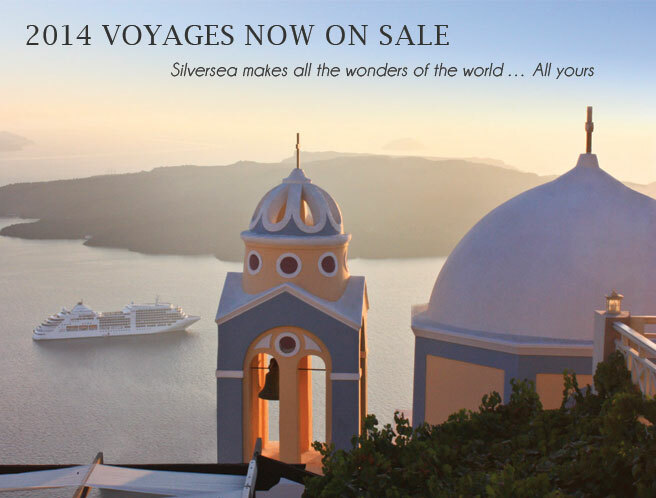 We’re delighted to announce that the Silversea 2014 programme is now on sale! With over 200 diverse sailings visiting more than 500 destinations on seven continents, our 2014 programme is truly one of the most extensive line ups ever. Designed to make the cruise buying decision easier, our new Silver Privilege Fares offer guests one simple low fare for their desired suite. These new cruise -only fares will reward guests who book early with the best possible fare and the privilege of being able to select their desired suite when the best inventory is available. In addition guests will be able to customise their entire holiday with Silversea’s optional air, transfer, hotel and land programmes. As such from 1 November 2012, the onboard spending credit and included air programmes will be removed on all 2013 and 2014 voyages. Available for a limited time on most 2014 voyages, guests can save an additional 10% on each voyage when combining two or more consecutive voyages. Departing 6 January from Los Angeles, visiting 54 destinations in 29 countries, and featuring 12 overnight stays, Silver Whisper will call at Polynesia and lands Down Under. From there, she will sail up to the remote island of Koror and then head west to spend a month exploring fascinating Asian cultures before concluding her journey in Barcelona. The legendary Golden Land, formerly known as Burma, is truly one of the most fascinating destinations in Asia. We’re delighted to announce two 2014 voyages (2438 and 3404) will both feature three night stopovers in Myanmar. For the first time ever, Silver Explorer will sail the Northwest Passage, the famed shipping route that connects the Atlantic and Pacific oceans through the Canadian Arctic. There will also be first ever voyages to the Russian Far East, Japan, South Pacific and French Polynesia. In total Silver Explorer will call at 84 maiden ports. 2014 will see the first full year of itineraries for our newest ship Silver Galapagos. Your guests can explore destinations inaccessible to most and encounter wildlife found nowhere else on earth with one of two new 7 day itineraries. Activities include guided nature hikes, Zodiac cruises, snorkeling and day after day of fantastic photo opportunities. Silversea’s team of naturalist guides, born in the Galapagos Islands and certified by the Directorate of the Galapagos National Park, are eager to engage guests with the unique and abundant nature of this remarkable region. We’re delighted to announce 13 maiden ports of call onboard our classic fleet. These include Melilla, Spain; Almeria, Spain; Haugesund, Norway; Eskifjordur, Iceland; Djupivogur, Iceland; Portland, England; Koror, Palau; Ponce, Puerto Rico; Trujillo, Honduras; Alotau, Papua New Guinea; Sept-Iles, Quebec; Trois-Rivieres, Quebec; Kavala, Greece.